Job Growth Halts; Unemployment Rate Stays At 9.1 Percent : The Two-Way The news comes as President Obama and his Republican rivals prepare their plans for boosting employment. There was no net growth in jobs in August and the nation's unemployment rate stayed at 9.1 percent, the Bureau of Labor Statistics just reported. The latest sign that the labor market remains weak comes as President Obama prepares to lay out his latest plan for boosting job growth — during an address to Congress next Thursday — and as the Republicans vying to run against him next year offer their alternatives. We'll be updating this post with details from the BLS report, and our colleagues at Planet Money will have more on it as well. "Next week, the president will lay out a series of additional bipartisan steps that Congress can take immediately to put more money in the paychecks of working and middle class families; to make it easier for small businesses to hire workers; to put construction crews to work rebuilding our nation's infrastructure; and other measures that will help the economy grow while still reducing our deficit and getting our fiscal house in order." As many had expected would happen, the dismal news on jobs hasn't gone over well on Wall Street. The Dow Jones industrial average and other indices are down sharply just after the opening of trading. The economy officially slipped into recession in December 2007 and officially came out in mid-2009. 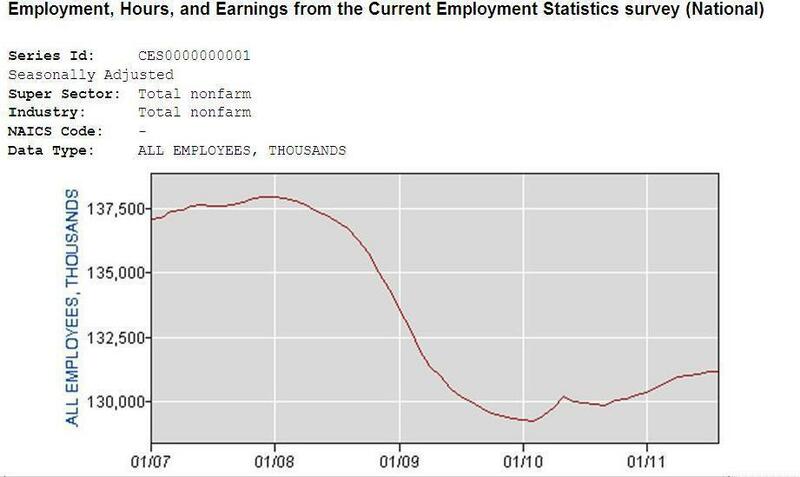 Here's a look at the number of jobs from January 2007 through August of this year. Update at 8:55 a.m. ET. Boehner Blames Taxes, A "Failed" Stimulus And Regulations. "Private-sector job growth continues to be undermined by the triple threat of higher taxes, more failed 'stimulus' spending, and excessive federal regulations. Together, these Washington policies have created a fog of uncertainty that's left small businesses unable to hire and American families worried about the future. "President Obama is slated to address Congress next week and I look forward to hearing his ideas to bolster private-sector job creation. The American people are still asking, 'where are the jobs?' Republicans are listening and focusing on removing barriers to job growth, whether it's eliminating unnecessary regulations that drive up prices or stopping Washington from spending money it doesn't have. I'm hopeful the White House will take this opportunity to work with us to end the uncertainty facing families and small businesses, and create a better environment for long-term economic growth and private-sector job creation." One reason the jobless rate held steady even though there was no job growth: 165,000 fewer people were counted as being part of the "labor force." There was a scant, 17,000-increase, in jobs on private payrolls and an equal-sized decline in employment at government agencies. Update at 8:36 a.m. ET. July Revised Down: Not only is BLS saying there was no net increase in jobs in August, it has also revised down its estimate of how many jobs were added to payrolls in July — to 85,000 from the preliminary estimate of 117,000.